Local attorneys move into new digs on 2nd Ave. Attorneys Eric Mulford, left, and Britt Wiseman, have moved into their new offices across the street from the Gallipolis Post Office on Second Avenue. In addition to their jobs as full-time assistant county prosecutors, the pair also work on a variety of civil law, real estate and estate cases. GALLIPOLIS — Many folks in Gallia County know attorneys Eric Mulford and Britt Wiseman as assistant prosecuting attorneys who excel at putting criminals behind bars. But did you know they also handle a variety of civil law cases? Now that the partners in the Mulford & Wiseman law firm have moved into their own offices, they’ll be better able to do that. The pair, who formed their partnership three years ago, formerly occupied an office on the second floor above Scites Insurance Agency at the corner of Second Avenue and Locust Street. Their new digs are at 435 Second Ave., directly across the street from the Gallipolis Post Office. Having their own space was a major motivator, but Mulford and Wiseman said they were also compelled to become part of downtown Gallipolis’ revitalization effort. “We were pretty excited when we started seeing the positive changes downtown, so we decided to be a part of that and get our own ‘storefront’ presence,” Mulford said. Now, Mulford and Wiseman don’t have to share a conference room or a secretary with another business, as they did before. Their current facility has about 4,000-square feet of office space – they’re using about half of it at the moment – with two offices and two conference rooms. The law firm also has off-street parking, which they feel is an added benefit of their new location. With their logo placed prominently on their front window, Mulford and Wiseman both said clients will find their office much easier. “Everything is on one floor and we’re handicap-accessible,” Mulford said. Being close to the Gallia County Courthouse, where Mulford and Wiseman both said they spend a great deal of time trying criminal cases, is also a benefit. “When we were looking for a space, there was only a two-block area where we could practically be,” Mulford said. 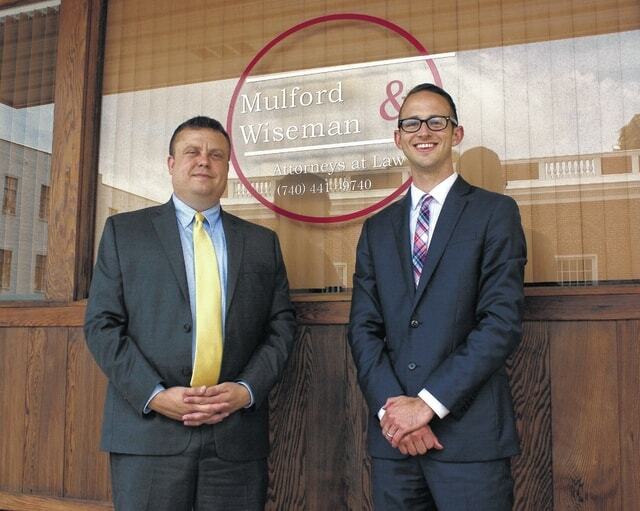 Most people are surprised when they learn Mulford and Wiseman also handle civil law cases. When he’s not in court with a criminal case, Mulford, who began practicing law in 2004, works on probate matters such as real estate and wills. Wiseman, who began practicing law in 2012, works on domestic relations issues such as dissolutions, divorces, custody cases, as well as evictions and some real estate work. Both also represent several area businesses as collectors. Mulford and Wiseman both agreed that working on estate and real estate issues is a “breath of fresh air” from the contested cases with which they are usually involved as assistant prosecutors. Both enjoy working in a small-town atmosphere that Gallipolis provides.